A regular breeding resident and migrant. The Bay-breasted Warbler was rare during the Minnesota Breeding Bird Atlas (MNBBA). Found patchily distributed across Canada from the Maritime provinces to British Columbia and in the northern portions of the Upper Midwest and northeastern United States. Highest densities have been observed in eastern Quebec (Figure 1). Assigned a 10/20 Continental Concern Score by Partners in Flight. Identified as a Species in Greatest Conservation Need by the Minnesota Department of Natural Resources. Designated a Regional Forester Sensitive Species in the Superior National Forest by the U.S. Forest Service. Long-distance migrant; the species overwinters from Panama to northern South America. Arthropods, especially caterpillars, all gleaned from trees, although the species will occasionally fly-catch. Cup nest placed on a horizontal branch of a coniferous tree and highly variable in height. Breeding distribution and relative abundance of the Bay-breasted Warbler in North America based on the federal Breeding Bird Survey from 2011 to 2015 (Sauer et al. 2017). Roberts (1932) described the Bay-breasted Warbler as “a rare summer resident in the northern evergreen forest” of Minnesota, a status that remains the same today. The species is the rarest of the three spruce budworm specialists, which also include the Tennessee and Cape May Warblers. It was one of the species intensively studied by MacArthur (1958) in his now famous studies on the population ecology of warblers. More than 40 years later, Green and Janssen (1975) described the Bay-breasted Warbler’s distribution as primarily Cook, Lake, and northern St. Louis Counties. However, they proposed a potential distribution as far west as eastern Roseau and Clearwater Counties and south to northern Hubbard and southern Itasca Counties. They included confirmed nesting only from northern Lake County. A few years later, Janssen (1987) restricted the warbler’s primary potential breeding range to only the northern portions of Beltrami, Cook, Lake, and St. Louis Counties, but he did include all of Koochiching and Lake of the Woods Counties as well as west to eastern Roseau County. Janssen (1987) and Hertzel and Janssen (1998) both identified confirmed nesting in Cook and Lake Counties since 1970. The Minnesota Biological Survey (MBS) has recorded 16 breeding season locations during their intensive surveys of Minnesota counties. All of their locations were found in Cook, Lake, and St. Louis Counties. At the time of writing, they had not yet completed surveys in northern Beltrami, Koochiching, or Lake of the Woods Counties. The MNBBA documented 46 breeding records for the Bay-breasted Warbler. These records included breeding evidence from 30 blocks, including 4 confirmed breeding records from northern St. Louis and Lake Counties (Figure 2). Probable nesting was recorded from Cook County, and a possible nesting in northern Aitkin County. These records represented only 0.6% (30/4,733) of the blocks in Minnesota, or 0.8% (19/2,337) of priority blocks covered during the MNBBA (Figures 2 and 3; Table 1). The lack of nesting records in Minnesota reflected a combination of this species’ genuine rarity, the difficulty in its identification, and a possible decline in its population in Minnesota. With the exception of Roberts’s (1932) reporting of possible Bay-breasted Warblers nesting in Sherburne County, this species’ distribution does not appear to have changed in Minnesota for more than 100 years. Its breeding distribution is closely tied to spruce budworm outbreaks. In their review of the Bay-breasted Warbler in North America, Venier et al. (2011) simply stated that there is “No information” available on historical changes to its distribution. In Wisconsin, the Bay-breasted Warbler is listed under the title “Seldom Reported Species.” It has never been confirmed as a nesting species in Wisconsin, and the state’s breeding bird atlas from 1995–2000 reported 1 probable nesting in Oneida County in northeastern Wisconsin and possible nesting from 3 other counties. In Michigan, the first confirmed breeding record was discovered in 1933. The species has been most consistently found in the Upper Peninsula, especially in the Keweenaw Peninsula (Chartier et al. 2013). Bay-breasted Warblers were very rare in the northern portions of the Lower Peninsula. The species is widely distributed in the northern portions of Ontario. Cadman et al. (2007) found no differences in Ontario between its first (1981–1985) and second breeding bird atlas (2001–2005). Breeding distribution of the Bay-breasted Warbler in Minnesota based on the Breeding Bird Atlas (2009 – 2013). Summary statistics of observations by breeding status category for the Bay-breasted Warbler in Minnesota based on all blocks (each 5 km x 5 km) surveyed during the Breeding Bird Atlas (2009-2013). Summary statistics for the Bay-breasted Warbler observations by breeding status category for all blocks and priority blocks (each 5 km x 5 km) surveyed during the Minnesota Breeding Bird Atlas (2009-2013). The Bay-breasted Warbler is found in intermediate to mature spruce and balsam fir forests, most frequently in those infested with spruce budworm (Mayasich and Niemi 2003) (Figure 4). It is primarily found in mid-age to mature spruce-balsam fir forests (Mendall 1937; Morse 1989). Venier et al. (2011) reported it from young mixed-wood stands during spruce budworm outbreaks and occasionally in bogs and swamps. Cadman et al. (2007) reported that in Ontario, where the species’ habitat is likely most similar to where it is found in Minnesota, the species is found in dense spruce and balsam fir forests. They also noted that the species was more common in second-growth forest (20 to 80 years old) and suggested it was not necessarily a mature-forest specialist. Green and Niemi (1978) classified the species as secondary in black spruce–tamarack forests of the Superior National Forest, but during intensive sampling in the Agassiz Lowlands Ecological Subsection in northern Minnesota, the species was seldom observed. Green (1995) also emphasized the conifer dependency of this species in Minnesota forests, plus suggested their use of riparian, lowland coniferous forest, which is a habitat that is seldom studied. Typical breeding habitat of the Bay-breasted Warbler (© Gerald J. Niemi). Partners in Flight (Rosenberg et al. 2016) estimated a global population of 9.2 million breeding adults in North America. Partners in Flight Science Committee (2013) estimated that only 130,000 breeding adults were found in the United States. The population for Canada was more conservatively estimated as being within a wide range, from 5,000,000 to 50,000,000 adults (Environment Canada 2011). The species was too rare in Minnesota to estimate a population based on the MNBBA point counts. Data from the federal Breeding Bird Survey (BBS) were unreliable for determining population trends for the Bay-breasted Warbler in Minnesota, where an average substantially less than 1 detection per route was recorded. The species was not recorded sufficiently during the National Forest Bird Monitoring program in Minnesota (Niemi et al. 2016) to determine a trend. Reliable data were available for the Boreal Hardwood Transition Region from 1966 to 2015 and indicated a significant decline of 3.85% per year (Figure 5). In contrast, based on all BBS routes completed in Canada and survey-wide, the warbler’s population trend was stable over this same time period. Partners in Flight (Rosenberg et al. 2016) estimated a 9% decline in the U.S. and Canadian population from 1970 to 2014. Canadian analyses also suggested a moderate decrease, but the authors emphasized the low reliability of the findings (Environment Canada 2011). During spruce budworm outbreaks, very high densities have been reported, such as the 120 to 230 pairs per km2 recorded by Kendeigh (1947) in Ontario. Erskine (1992) recorded densities in Canada as high as 4 males per ha during spruce budworm outbreaks. BBS routes in Ontario recorded an average of 3.22 detections per route per year for the Bay-breasted Warbler (Sauer et al. 2017). 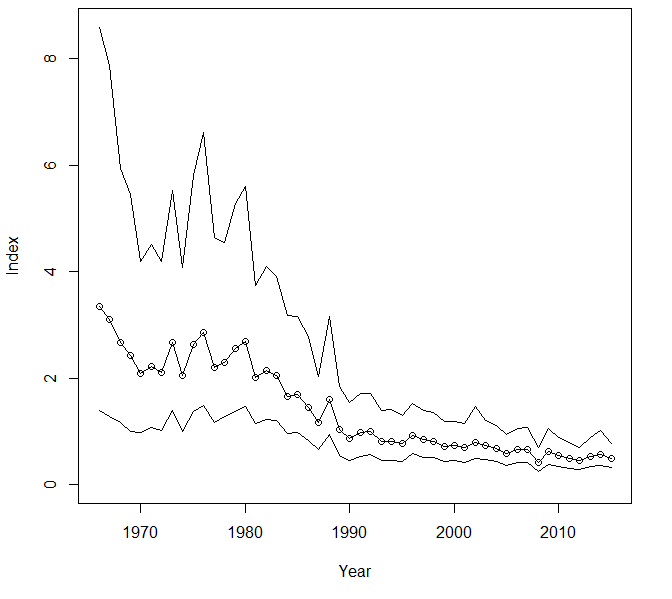 Breeding population trend for the Bay-breasted Warbler in the Boreal Hardwood Transition Region for 1966–2015 based on the federal Breeding Bird Survey (Sauer et al. 2017). The Bay-breasted Warbler has a moderate Continental Concern Score of 10/20 reported by Partners in Flight (Rosenberg et al. 2016), a status primarily due to its long-term population decline. The Minnesota Department of Natural Resources has identified the Bay-breasted Warbler as a Species in Greatest Conservation Need (Minnesota Department of Natural Resources 2015). This listing was primarily based on habitat loss and its narrow thermal preferences. The latter render this species’ future in Minnesota as tenuous because of climate change and the predicted loss of spruce-fir coniferous forests. Langham et al. (2015) and the National Audubon Society (2015), in their review of bird species susceptible to climate change, labeled this species as “climate threatened.” As also predicted for the Cape May Warbler by climate models, only 4% of the Bay-breasted Warbler’s current summer breeding range is likely to remain stable. The species will need to colonize appropriate forests farther north in Canada. However, during the second Ontario breeding bird atlas (2001–2005), there was a substantial decline in the population of Bay-breasted Warblers in the Hudson Bay Lowlands of northern Ontario (Cadman et al. 2007). Whether the species can adapt to and thrive in habitats of northern Canada is unclear at present. Concerns for this species in Canada, where the bulk of its breeding population is found, are related to the warblers’ dependence on mature forested areas and spruce budworm outbreaks (Environment Canada 2011). Winter populations may be affected because of the species’ restricted wintering range and its use of mature forests that are subject to deforestation and development (Venier et al. 2011). The decline in populations is thought to be related to smaller populations of spruce budworm, a cyclical species that may or may not return to population levels found in the 1970s. Bay-breasted Warblers may also be negatively affected by short-rotation forestry practices and those that do not favor spruce or balsam fir (Environment Canada 2011). Collisions with communication towers have been identified as a serious concern for the Bay-breasted Warbler. Arnold and Zink (2011) identified this species as a “super collider” and ranked it number one as the most frequently killed at tower sites. They estimated that its risk is 236 times greater than the average bird’s. Longcore et al. (2013) supported the estimate of this risk and further estimated that 5.5% of the Bay-breasted Warbler population is killed annually at communication towers. Its susceptibility to tower-kill mortality is widespread. It is ranked second among all species in the Appalachian Mountains/Piedmont region, sixth in the New England/Mid-Atlantic Coast region, seventh in the Central Hardwoods region, and eighth in both the Eastern Tallgrass Prairie and the Prairie Hardwood/Boreal Hardwood Transition Regions. Given the information reported here, the future of the Bay-breasted Warbler is very dubious. During the breeding season, it is likely a slave to spruce budworm outbreaks and their inherent variability. Its adaptability to the impacts of climate change is uncertain. During the migration season, it faces substantial obstacles that are all projected to increase in the future, while the stability of its wintering grounds is largely unknown but certainly an additional concern. Chartier, Allen T., Jennifer J. Baldy, and John M. Brenneman, eds. 2013. Michigan Breeding Bird Atlas II. Kalamazoo, MI: Kalamazoo Nature Center. Erskine, Anthony J. 1992. Atlas of Breeding Birds in the Maritime Provinces. Halifax, Nova Scotia: Nova Scotia Museum. Green, Janet C. 1995. Birds and Forests: A Management and Conservation Guide. St. Paul: Minnesota Department of Natural Resources. Green, Janet C., and Gerald J. Niemi. 1978. Birds of the Superior National Forest. Washington, DC: U.S. Department of Agriculture Forest Service. Kendeigh, S. Charles. 1947. Bird Population Studies in the Coniferous Forest Biome During a Spruce Budworm Outbreak. Ontario: Department of Lands and Forests. Longcore, Travis, Catherine Rich, Pierre Mineau, Beau MacDonald, Daniel G. Bert, Lauren M. Sullivan, Erin Mutrie, Sidney A. Gauthreaux Jr., Michael L. Avery, Robert L. Crawford, and Albert M. Manville II. 2013. “Avian Mortality at Communication Towers in the United States and Canada: Which Species, How Many, and Where?” Biological Conservation 158: 410–419. MacArthur, Robert H. 1958. “Population Ecology of Some Warblers of Northeastern Coniferous Forests.” Ecology 39: 599–619. Mayasich, Joseph, and Gerald J. Niemi. 2003. Conservation Assessment for Bay-breasted Warbler (Dendroica castanea). Report to U.S. Department of Agriculture Forest Service, Eastern Region. Natural Resources Research Institute Technical Report NRRI/TR-2003/17. Duluth: University of Minnesota Duluth, Natural Resources Research Institute. Mendall, Howard L. 1937. “Nesting of the Bay-breasted Warbler.” Auk 54: 429–439. Morse, Douglass H. 1989. American Warblers: An Ecological and Behavioral Perspective. Cambridge: Harvard University Press. National Audubon Society. 2015. Audubon’s Birds and Climate Change Report: A Primer for Practitioners. Version 1.3. New York: National Audubon Society.